Horsley Hills are located in Chitoor district of Andhra Pradesh, near the enchanting town of Madanapalle. 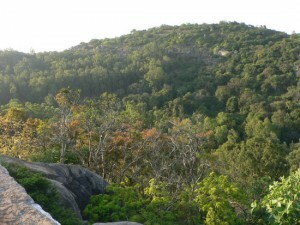 At a distance of 144 km from Tirupati, 150 km from Bangalore and 25 km from Madanapalle, Horsley Hills are easily accessible. Climate is cool in summer and chilly in winter, and pleasant round the year. Horsley Hills have lush vegetation and a picturesque landscape, While Rayalaseema, the region in which the hills are located, is dry and arid, they form an oasis of verdant valleys, The drive from Madanapalle, downhill, to the resort through the groves of teak, sandalwood eucalyptus, gulmohar, mango and other luxuriant emerald green vegetation, today, is simply memorable.the; hill station offers fine possibilities for trekking, hiking, leisure walks in the lap of nature and bird watching., And once the limbs start aching, one can just laze around or even better, fall off to sleep on the slopes of these enchanting hills. 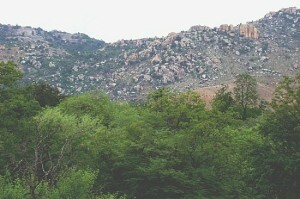 Horsley Hills are a little above three hours drive from Tirupati and Bangalore. Regualr bus services are available from Tirupati and Madanapalle, Taxis are also available from Tirupati and Madanapalle. The nearest airport, Tirupati, is well connected by air, rail and bus from Chennai, Hyderabad, Bangalore is well connected with all the major cities of India by air and rail. Nearest railhead is Madanapalle. AP Tourism offers excellent accommodation at Horsley Hills at its Punnami Hill Resorts. Gurram Konda: Located within the hill tracts of Horsley Hills, Gurram Konda, so named as the steep pathway was once accessible only on horseback, Atop the 500 ft. high hill is a fortress, said to have been; under the occupation or Raza All, nephew of Tipu Sultan, the tiger of Mysore. Stone plaques at the fort suggest that Tipu himself stayed here once. Gall Bandalu: The rocky slope with a steep fall, Gali Bandaluy, are named so because of the strong wind that blows throughout the day, It is a thrilling spot offering spectacular views of the sunset. Besides, the tallest tree and the highest point are the other attractions, the beauty of Horsley Hills is that all the places are within walking distance of each other; and the entire hill station is open for exploration. Located on the way to Horsley Hills from Madanapalle. The Rishi Valley attracts hundreds of species of exotic birds, migrating from different parts, So much so that the Valley and Horsley Hills are a heaven for bird watchers. This entry was posted in Andhra Pradesh, Hill, Horsley Hills. Bookmark the permalink.